Fig. 3.29 Rhinoplasty. 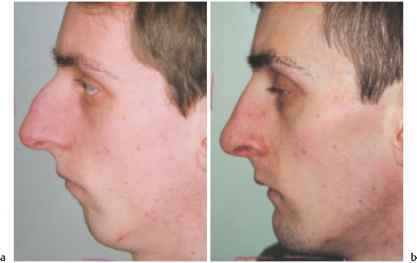 The appearance of a nose with a congenital or traumatic hump of the nasal bones can be improved with rhinoplasty (a, b; c, d). 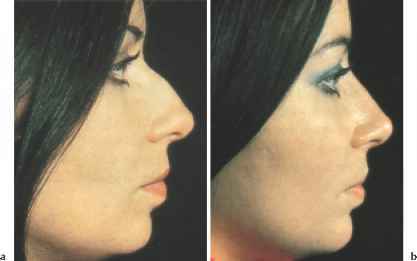 A deviated nose may be straightened (e, f). Fig. 3.30a-f Nasal tip rhinoplasty. 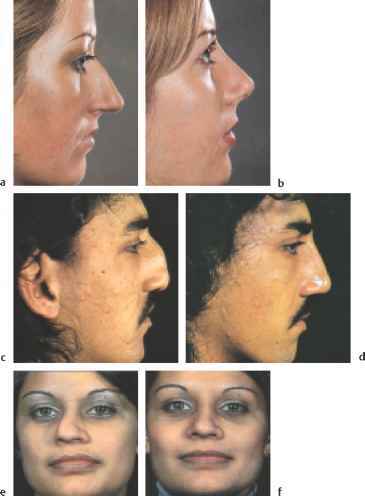 Bulbous or bifid nasal tips can be modified (a, b). 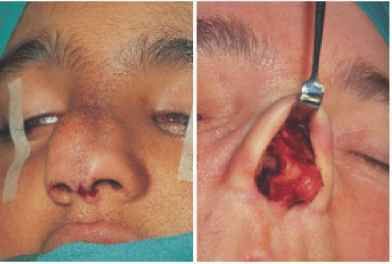 Incisions for rhinoplasty are within the nasal vestibule and access to the nasal bones, cartilages, and septum may be obtained with an intranasal (or external, see Fig. 3.31) approach. transverse incision across the columella (with a "notch" to give a minimally perceptible scar) enables the skin of the nose to be elevated superiorly with exposure of all the underlying structures (b). 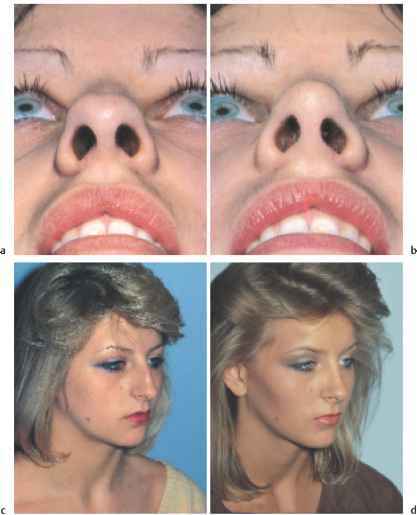 This rhinoplasty approach is used for many of the grosser nasal deformities, e.g., cleft-lip nasal deformities. 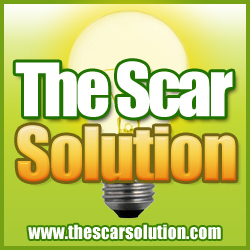 It also enables lesions on the dorsum of the nose to be excised without an obvious overlying scar. 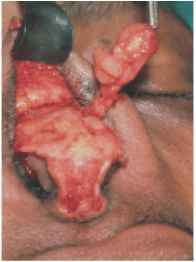 The lesion being removed here is a nasal sinus (c). Fig. 3.32 Mentoplasty. 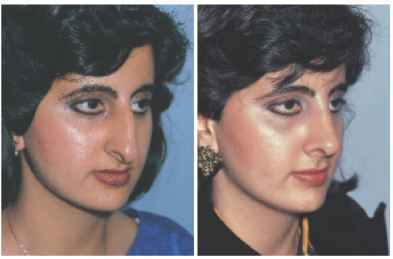 The improvement with rhinoplasty in this case has been accentuated by mentoplasty. Fig. 3.33 A silastic implant has been inserted adjacent to the mandible. A receding chin is not to be overlooked in a patient seeking rhinoplasty, for it accentuates the nasal deformity, and mentoplasty gives a subtle but striking improvement in appearance. This implant may be introduced either by an external submental incision or on intraoral incision via the mucosa of the buccal sulcus. Fig. 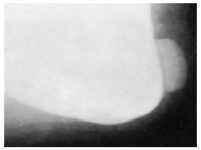 3.34 Marked mandibular underdevelopment (a) in which a mandibular advancement to restore dental occlusion as well as the esthetics was combined with a rhinoplasty (b). 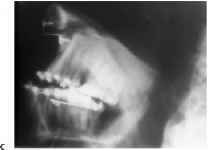 The radiograph (c) shows the sliding advancement and wiring of the mandibular bone.